Hey, Sunshines! Its me, Tanya Here! Today I want to tell you about Fashion Around The World! Our todays destination is Ukraine! Well I live in Ukraine, and I think our national clothes are kinda stylish! But its not a geography lesson , right? I wont tell you about the history, geagraphy... I'll tell you about the Fresh Style and Fashion of Ukrainian Designers and TheUkrainian Fashion Week!! 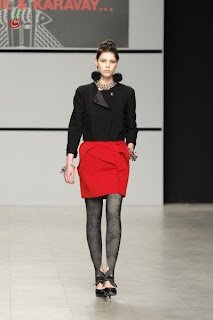 The Collection is made in Ukrainian National colours : White, Black and Red. Julia takes the most fashionable stuff for Spring/Summer 2009. Leggins, Stilletoes, Cute belts and dresses! This collection has also its own Style! Gold and Black Leggins, Red Moto Gloves, Fur Collar will also be a trend in Fall/Winter 09/10! P.S. Wait for the next Fashion Around The World really soon!